Faultless Software to Perform the Task of Exporting Multiple Microsoft Outlook MSG Files to Lotus Notes NSF. MSG to NSF Converter allows users to migrate numerous Outlook MSG files to Lotus Notes in a trouble-free way. The software mainly focuses on the bulk conversion and on the safety of the data. Users just need to install the tool on the machine and then choose the need MSG files that needs to be exported. This is an efficient migrator, which permits users to shift one or more folders to from MSG to Lotus Notes. For this, users need to choose the option of “Add Folder” available in the panel of software. They can even remove any of the added folders, if needed, by a simple click on “Remove” button. The application is capable enough that it can retain the folder hierarchy during and after the conversion. This means user will get the converted or resultant NSF file in the same structure as it was before. This feature helps users to access the files after the process of migration with no complications. Another important as well as amazing feature, which is added to the utility is that it provides the option to convert only selected emails. 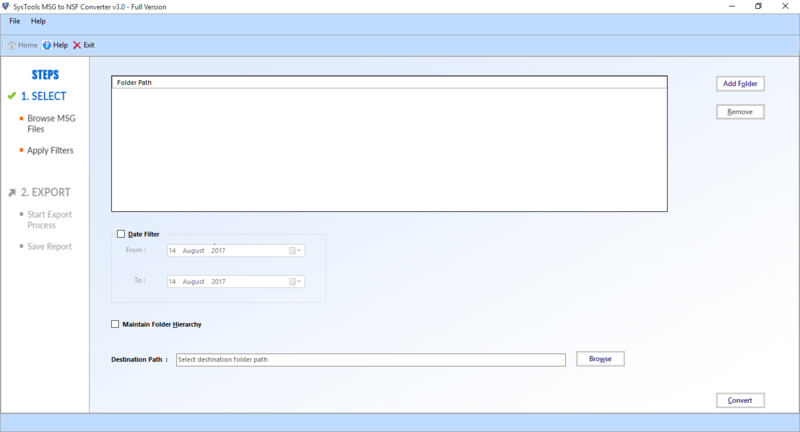 Users need to choose the date range by click on Date Filter option. As soon as they do this, all the emails falling under that date range will appear to the screen and then users can proceed for the conversion process. This innovative product completes the procedure of export by keeping the data safe and protected. It requires the installation of Lotus 8.5, 9.0.1 to execute the migration from MSG to NSF. 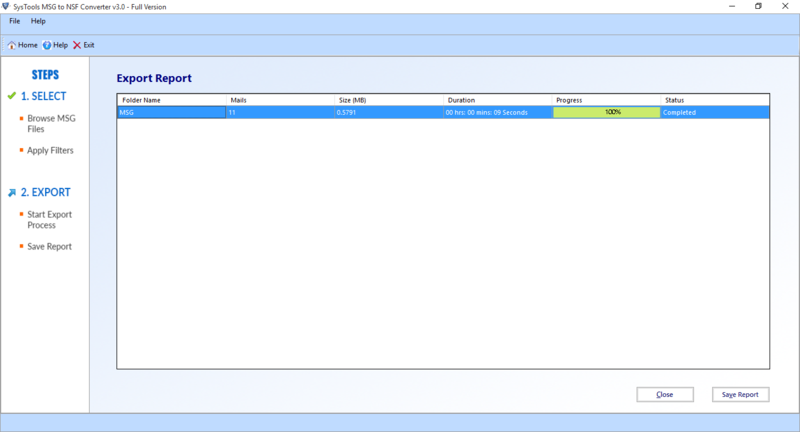 After the completion of the procedure, it generates a completion report in CSV format. This report can be used for future proposes by users if needed. Why We Need MSG to Lotus Notes NSF Conversion? In the final step, you may view the report from the chosen location. Is it possible to move corrupt MSG to NSF format with MSG to NSF Converter? No, the software does not support unhealthy or damaged MSG files for conversion. 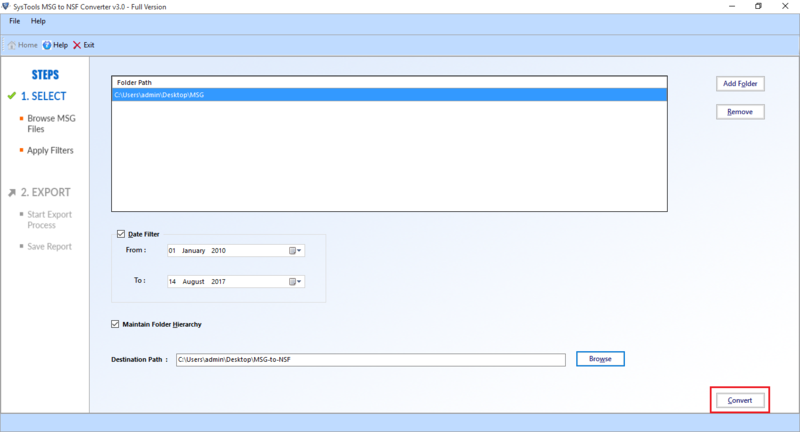 Can I only migrate the MSG emails in Lotus Notes that are useful? Yes, selective exporting of MSG files is feasible by using Date Filter option of the tool. Can I install and run the utility in Mac OS X and perform migration? No, it is not possible to run the program in Mac OS X, as it is a Windows based product.